For those of keeping up with Kamen Rider Zi-O, you may be aware of the show’s recent dive into the timeline of Kamen Rider Ryuki and the Rider Battle Royale returning anew. To coincide with this, P-Bandai just opened up pre-orders for the Mirror World Ride Watch set. 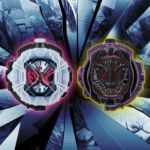 The DX Mirror World Ride Watch set will include Ride Watches for both Mirror World Zi-O and Another Ryuuga. Pre-Orders will begin February 3rd, 2019 and will run until March 4th, 2019. The DX Mirror World Ride Watch set will ship out in July 2019 retailing for 3,240 yen.